Vienna is full of public art, mainly grand statutes and memorials commemorating famous musicians, writers, Hapsburgs, generals, and politicians. 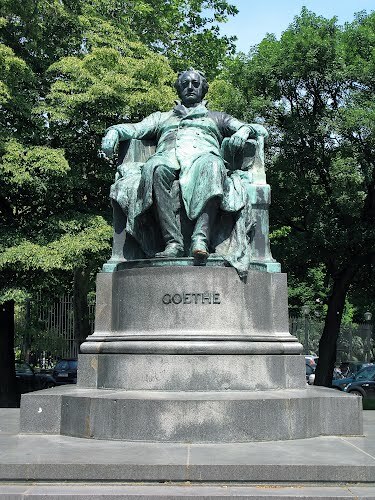 For example, the statutes of Johann Strauss, Goethe, Franz Josef, Mozart, and Maria Theresa, among others, are located in visible locations and attract the attention of visitors in the city. They have both historic and aesthetic appeal. 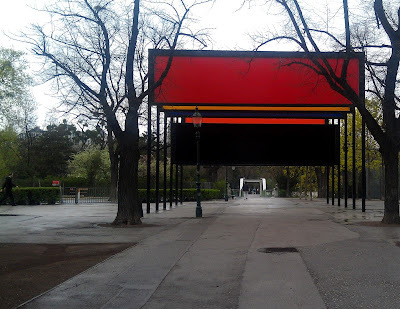 Other public art is often more difficult to find, and I was happy to stumble on a pleasing and enjoyable art installation in Vienna's Stadtpark, the huge urban park that is bordered by Parkring. 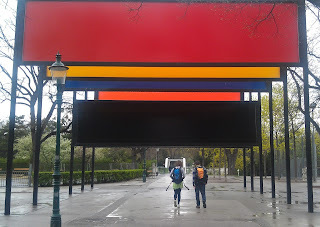 On a path in midst of the park, not far from a foot bridge crossing the paved Wienfluss -- Vienna River -- that runs through it, stands six large fabric panels mounted at different heights, each with a different vivid color. The panels are over the walkway, and because they have different heights, the relationship of the colors -- that is, the juxtaposition and visibility of different colors -- changes as a person walks toward them. The result is dynamic art that fetches attention from the time it is first noticed until a viewer passed under the panels. Part of the pleasure of this art is the surprise of seeing it in an unexpected location: along a path surrounded by trees and other greenery. Another element of its attraction is the changing colors framed by the park and the classic architecture of the city that lies beyond the park boundaries. Also, the act of walking into and through the art enhances enjoyment of it. The picture above was taken on a cloudy, drizzly day, deepening the colors. The visible colors from this perspective were orange, yellow, blue, red, and black. One panel (green) is not visible. A bridge across the Wienfluss can be seen in the distance. Trees stand in front of the panel; when the trees have leaves, they will add additional colors. Also, note a lamp on the path in the front of the first panel. When it is lit in the evening, its light will change the colors. Walking a few steps closer to the panels exposes more yellow, blue and orange. Each step shows the colors in a different relationship. 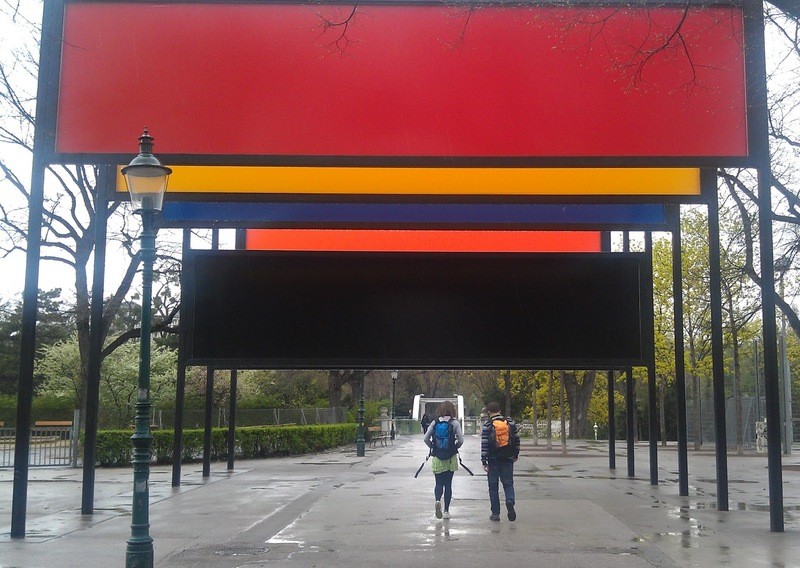 In this picture, two people are walking through the art. 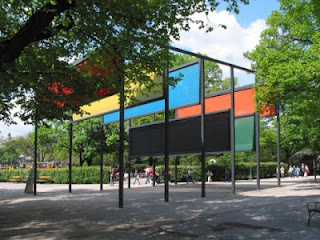 Another picture -- this one downloaded from the internet -- shows the art installation in summer when it is framed by trees and more brightly lit by the sun. Near the panels of color is this sign identifying the title of the piece of art as "Stage Set, 1966." 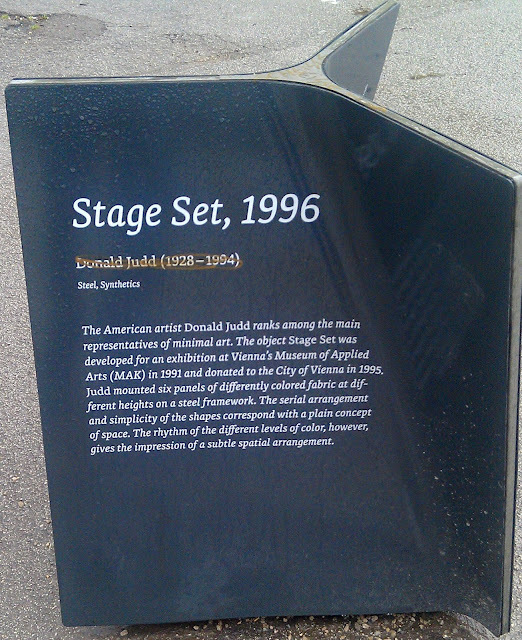 The artist was Donald Judd (1928-1994). The art was developed for an exhibition at the nearly Museum of Applied Arts in 1991 and it was donated to the City of Vienna in 1995.